This unit is no longer available. We recommend the LA2 LightningAir Plus. The LightningAir is not a filter. Instead it re-creates the same process that Mother Nature uses to keep the air fresh. It generates the negative ions that nature uses to significantly reduce dust and other particles in the air. It also produces activated oxygen to significantly reduce odors without the use of fragrances. It helps to break down mold, mildew and other pollutants at their source. Cleans up to 5,000 sq. ft.
A little machine that produces 22.6 trillion ions per second! � Compare to some filtration systems that use over $1.00 per day for only one room. 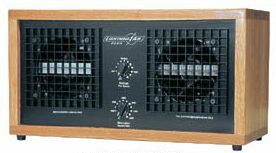 This unit has both a needlepoint and radio frequency Ionizer. Four Cold Plasma Dialectic Plates. Ozone output varies dramatically with level of humidity, temperature and other environmental factors. Output is regulated by a manual variable setting. Purifies a range of 200 to 5000 square feet depending on variables such as humidity, placement, amount of pollution and temperature. This product is manufactured by SpringCo.